Data discovery has become a big deal to organizations of all sizes, and we know why. We review the reasons and the value that data discovery adds to the search for business insight. Why Is Data Discovery a Big Deal? Because it’s one solution to a very big, Big Data management pain. It’s the search through huge volumes of information, which provides business users with relevant information expressed in business terms. The biggest challenge of Big Data is that more information arrives every day. It doesn’t stop. And there are fewer data professionals to find, wrangle and analyze it. These days, business users replace data specialists in a less structured, question-and-answer approach to data discovery. Now, the focus is on getting relevant answers to business questions with minimal IT help. Self-service. DIY capabilities enable business users to handle and interpret data, without time-consuming detours through the IT department. The step-by-step process helps users refine their searches until they get exactly what they want, without scripts and knowledge of query languages. High-speed, high-volume search. Business users must discover and interpret business information quickly enough to respond to changing business conditions. That makes the ability to search huge volumes of information crazy-fast a must. Modern data discovery tools do this by automating the highly technical, time-consuming search and tagging process that prepares information for analysis. Data blending and mashups. Advanced software can now automate the search through many data sources and describe many types of structured and unstructured information. The goal is data blending—consolidating diverse data into a single source and preparing it for analysis. Push data. You’ll never get an accurate analysis with out-of-date information. It’s now possible to push data from event-driven and streaming data sources to ensure that you’ll find and analyze only the most current available information. Each of these capabilities provide an express route to savings in time and money. Next, we’ll review the data discovery prowess of several leading data analytics platforms. 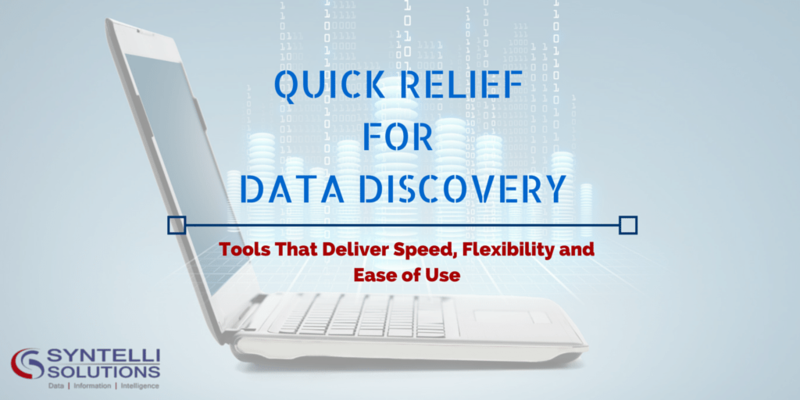 Visual data discovery tools emphasize self-service and ease of use. The keyword for this capability is “visual.” Developer TIBCO has been praised for Spotfire’s ease of use, which enables business users to explore data with a visual, highly intuitive interface. The Tableau Desktop uses s tory points, which help users present the data as a story, with a beginning, middle, and end. Users insert a data visualization onto an electronic “canvas” and save the filters that create the story behind the data analysis. High-speed Big Data processing enables accurate, timely decision making. The Hortonworks Data Platform enables distributed parallel processing of huge amounts of data. HDP offers linear-scale storage and compute capabilities for batch, interactive, real time, search and streaming data handling methods. Data blending cuts time and cost of traditional data handling methods. Tableau Desktop brings data from multiple data sources into one view, without the need for any special coding. This approach provides a relatively quick and straightforward way to extract value from multiple data sources. Tableau software blends two data sources automatically when it detects a common field among two or more data sources. Flexible push data capabilities meet your operations requirements. After you publish data extracts and workbooks to Tableau Online, there are three ways to keep the data fresh. Tableau Online can maintain a live connection to some cloud-based data sources, such as Google BigQuery. Or, you can refresh these extracts manually at any time or automatically on a schedule. Finally, you can push data to Tableau Online using Tableau Desktop or a command-line utility that comes with Tableau Desktop. Next Time: We get into the details of data visualization and analytics methods.